One of the new features of SDL Trados Studio 2011 SP2 that I mentioned in my previous post is the option to show track changes in source segments. Is this going to be a useful option or is it just a gimmick? Well, as a medical translator, I’m actually quite excited about it. Why would you want to show track changes in source segments? Medical translators sometimes have to update product information submitted to the European Medicines Agency (Summary of Product Characteristics, Package Leaflets and Labelling). In these regulatory documents, changes made in the source language are marked through Track Changes in the Word file and have to be translated using the same Track Change option in the target language. Clinical trial documentation is another area where Track Changes may be needed in source and target documents. Amendments to Protocols and Informed Consent Forms in source documents have to be reflected in their translations and back translations in a controlled environment. Does SP2 make it easier? Studio 2011 SP2 has streamlined the change control process and now you can open your document in Studio, see the track changes in the source segments and translate them quickly and efficiently. When you save the target document, all the track changes are there to see in Word. Normally, of course, you would accept all changes before translating a document. In fact, by default, Studio will warn you that there are track changes in your document so that you can go back and accept them in Word. The difference now is that there is an option to process the document with the track changes showing in the source segments. First, a note about file types. Product information submitted to the European Medicines Agency is only accepted in Word 2003 format (.doc) and, unfortunately, Studio has only implemented this new feature for .docx files. So you’ll need to convert from .doc to .docx to begin with and remember to save your translation as .doc at the end. Now open the file. 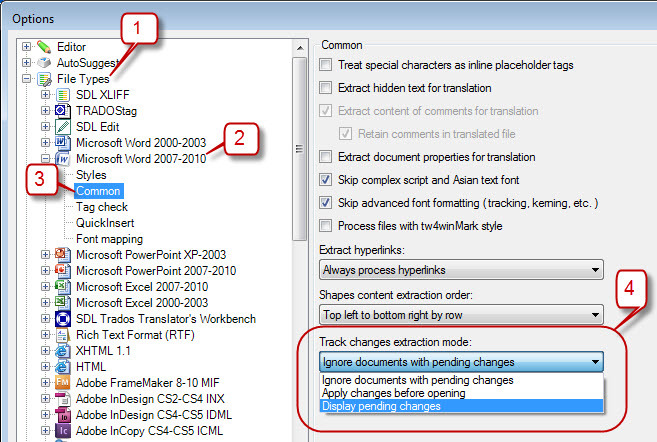 Translate the document, making sure that Track Changes is toggled on in the toolbar. You can see what the segments look like by changing the “final mode” display (equivalent to “Final: Show Markup” in the Review tab in Word). You’ll still benefit from 100% matches in your Translation Memory because they will be inserted in the target, with a blue TC icon that indicates the 100% match that you would have got if the Track Changes had been rejected in the source. At the same time, Studio looks up matches for the segment with the new changes and offers any findings in the Translation Results window. If you just want to view segments containing Track Changes in the Editor window, don’t forget that you can use the display filter: Display>Segment Review>With tracked changes. The changes that you make in the target segments are shown when you click Shift+F12 (save as target) and open the target file in Word. This completes the controlled change workflow environment for regulatory documents. When there are only a few changes in a file, it doesn’t make sense to charge by the word, because the cost of translating 50 or 100 words won’t cover the time you’ve spent replying to emails, entering the job in your project management tool and issuing your invoice. So I recommend charging by the hour or a minimum rate. If, however, the original document has been heavily edited, your client may want to pay you by the word. Unfortunately, MSWord doesn’t count words in tracked changes. One solution is to count the words manually. A better solution is to use a macro. I found one that does the job very well in a PC Review forum posted halfway down the page by Jay Freedman, a Microsoft Word MVP. The macro will count all new inserted words, but it ignores any deleted text or other changes. It’s still a nifty little macro though, and has helped me calculate my translated word count several times since I discovered it. Seeing the track changes in the source and reflecting them in the target without leaving Studio is a great new feature in SP2. If you want to learn more about it, I thoroughly recommend Paul Filkin’s article on this subject. And enjoy using the macro if it’s new to you! This entry was posted in 2. Beyond the Basics, Regulatory, SDL Trados Studio and tagged SDL, SP2, Studio, Studio 2011, track changes, Trados. Bookmark the permalink. Hi Emma – great explanantion! I have not had the opportunity to try TC in SP2 yet, I was never really “friends” with it when it first appeared, but I will certainly try it when I send my next project to the editor! Hi Anna, Yes, give it a try. It’s a very intuitive feature for translators who are familiar with TC in Word documents already. Enjoy! What really bugs me about TC is the way it did mess up the Auto-propagation, but perhaps it does not do that anymore. I will certainly try it! End Ifd instead of Enf If, as shown in the image. Many thanks for spotting that! I’ve uploaded the corrected version now. Great post, Emma. I used this function today for the first time and this was very helpful. Glad it helped, Alejandro, and – needless to say – I love your blog! Emma, your explanation was very easy to understand – even at 5 AM – it helped me to get from a nightmare to a relaxed translation in SDL. Thank you very much! Hi kishajnalka, I’m pleased you found the explanation clear. I hope working at 5 am isn’t a regular thing! Emma. same from here. Your smart and elaborated explanation is a huge help! Saved hours of frustration! You’re right, Anna, lack of AP is a big disadvantage of working with tracked changes. It actually only affects TC in target segments, so you can process a file with TC in a source file, see the TC in the Editor window and use AP without any problem, but you can’t reflect the TC in the target. Still, that’s probably not very useful in a real-life scenario, so I share your concern. I have a couple of questions which I hope you can shed some light on. 1) If a clinical trial protocol has been translated before, and then the medical client sends you a protocol amendment with extensive track changes (.docx format; let say for EN into an EU language with 12,000 words in total; with 4,000 new source texts changes), will all the previously translated and unchanged segments show up as perfect matches in Studio 2011? Therefore you can just focus on translating the track changes (for the new 4,000 words only) using the display filter view – “changed segments” only? Furthermore, will the suggested translation show up for the TCs source texts depending on the size and content of the client TM? Also will these suggested translation be displayed in the target segments? 2) Are there any risk to this process compared to the old method of accepting all TCs followed by translated and performing Document Compare to recreated a redline document? 3) What happens when you have lots of tables with TC in the source? Can Studio 2011 handle these well in TC mode? 3) Assuming that you don’t have a copy of Studio 2011 to work with, can the LSP or agency you work for export a TC source file as a bilingual Word file for you to work on at the initial “translation” phase? By this I mean no translation of TCs have been made at this point and a bilingual Word file will be created for you to work on. As I understand it, the purpose of the “Export for External Review” feature is to allow editors and client reviewers to review a TCs file which is already translated. Again. if you have a lot TCs in tables and labels for figures, how will this be handled in the bilingual Word file? I guess there will a lot of disadvantages working with directly translation the texts outside of the CAT environment. One obvious disadvantage is the inability to see the target document in its final form. 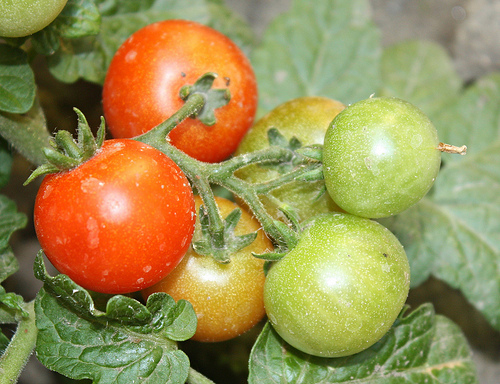 3) There a previous discussion about the feature of “Auto-Propagation” not working well in TCs mode here. In case you have a lot of reps, will AP not work when translating the source texts? So they have to be updated one by one? 1. Yes, the unchanged segments will come up as perfect matches. You can filter by “unconfirmed segments” to see the others. The changed segments will be shown as draft and “TC” as the status (see screenshot above) with the previous translation offered in the target segment. 2. There’s no risk. It’s a good way of translating regulated documents such as protocol amendments. 3. I haven’t come across any problems with TCs in tables. 4. I haven’t tested this scenario. Maybe you could have a go and report back with the results? 5. Yes, Anna is quite right in her comment above about Auto-propagation not working when TC is on. That’s a big disadvantage. Thank you very much Emma for your insights! Awesome! You have saved my skin today. Thank you very much for these great instructions!